Ready in 2 mins. Genuine goodness. Gluten free. Free from artificial colours, flavours and preservatives. Suitable for vegetarians.Our Classic Grains have been selected to help you create delicious and wholesome meals in minutes. 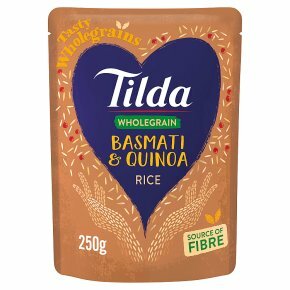 With its wonderful taste and satisfying crunch, quinoa tastes simply superb alongside our nutty wholegrain Basmati. Why not try... Add lemon zest and cold salmon for a light lunch. Serve with a lightly poached egg and griddled asparagus. Take care when handling the heated pouch. Squeeze pouch, tear strip 2cm, microwave 800W 2 minsMicrowave ovens may vary. Adjust cooking time accordingly. Stir fry for 3 mins, serve & enjoy.